Many Mac users have noticed that the good old Invert Display keyboard shortcut disappeared from Mac OS some time ago. Well, it didn’t disappear completely, but Invert Display is now tucked into a submenu of Accessibility options via a keystroke on the Mac. The change to the Invert Display keyboard shortcut first happened with Mac OS X Mavericks and Mountain Lion but it persists today with macOS High Sierra and Sierra too, where it was replaced with a different Command + Option + F5 keyboard shortcut that summons Accessibility Options, from which you now have to manually invert the screen by checking a box on or off. 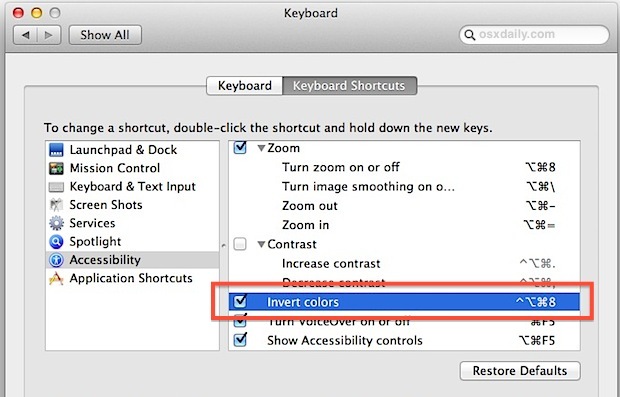 If you want to get the good old fashioned Control + Command + Option + 8 inversion keystroke back on the Mac, here is how to enable it again in Mac OS and Mac OS X. Hit Control+Option+Command+8 to invert the display colors, and hit those keys again to normalize the display again. Just like the good old days of Mac OS X.
Invert Display quite literally inverts all the colors on the screen, so blacks become whites, whites become blacks, blues become oranges, oranges become blues, etc. Display color inversion has had a long history of being used as a prank on unsuspecting users, which can be hilarious, but it actually has many legitimate uses as well. For those with visual challenges and some forms of color blindness, it can make certain screen elements easier to see, and even for those with normal eyesight it can be a great feature to enable in dim lighting to reduce eye strain and make it more pleasant to read and use a screen at night (though it’s a very different experience than from apps like Flux). There are many reasons to use Invert Display. In case you were wondering, the screen colors can also be inverted with the iPad or iPhone too. If a web site has the retro color scheme of white text on a black background, inverting the colors lets you read the text without breaking your eyes. You can switch back and forth on the fly, so you can look at the pictures as you read the text. Inverting the colors is also helpful with parts of iTunes, though they mercifully use white-on-black less than they used to.